In Making Pictures Move, I briefly referred to the “time lapse” photography technique made famous by Edward Muybridge, in which a series of rapidly taken still photographs could be used to freeze the motion of moving person or animal. Technology moves on, of course, but sports TV in particular now makes use of similar technique to show how international athletes piece together their performances. In addition to augmenting sports broadcasts, the technique can also be used to support the training of athletes, or as a more general educational aid. The StroMotionTM name presumably takes inspiration from the word stroboscope. Explain in what way(s) this is appropriate. What video clips can you think of that might reveal some insight if they were processed using the StroMotionTM approach? Sports broadcasting also makes use of ‘augmented reality’ techniques, for example in the use of digital “overlays” on top of a video image where lane numbers may be overlaid on top of the pool lanes in a swimming competition (or indeed, as a moving ‘world record pace’ line showing how close the actual swimmers are to a world record pace), or distances may be plotted from the ball to the flag in a golf broadcast (see for example the Vizrt VizArenaTM system, which “enables broadcasters to superimpose static and animated 3D graphics over the live coverage of a sports event”). As another example, the BBC “Piero” system can be used to add ‘tied-to-pitch’ graphical overlays and 3D views of recorded sports action by placing players in a virtual stadium within which they can be viewed from different angles (Piero, also described here: Piero sports graphics system wins two awards). What other examples of ‘digital overlays’ can you think of in the realm of sports broadcasting? Add any links you find – particularly links to video examples – as a comment below. Looking back at screenshots of some of the original video arcade games, and comparing them to the increasingly realistic imagery of games on the latest generation consoles, it is difficult not to be amazed at how much the visual appearance of the games has evolved. The advances in both computer hardware design and software development mean that today’s games hold the promise of photorealistic views in the not too distant future. But is this desirable? (see for example: Videogame Aesthetics: The Future). 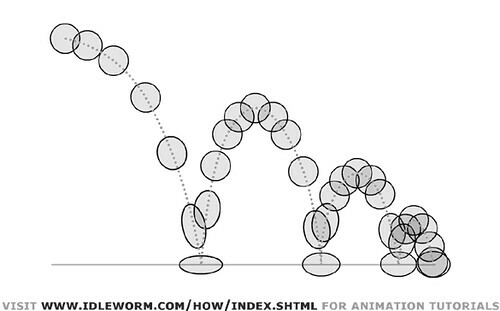 Even animated movements themselves are becoming more realistic, through the use of motion capture techniques (as described in Realistic Movement with Motion Capture). However, when the motion capture to animation technique is not quite right, then the resulting animation can feel very off-putting. For example, in the CGI movie Polar Express, audiences were left feeling uncomfrtable by much of the animation, as this post by animator Ward Jenkins describes: The Polar Express: A Virtual Train Wreck (conclusion). This effect has come to be known as the uncanny valley. The still unproven “uncanny valley” effect was coined by Japanase roboticist Mashahiro Mori, based on his observations about peoples’ emotional response to robotic or animated representations of living things. The claim goes that we are likely to have an increasingly positive emotional response to a representation as it becomes increasingly lifelike until something ‘not quite right’ (i.e. unnatural, or ‘uncanny’) comes to our attention, at which point we become negatively disposed to, or even repulsed by, the object in question. Read this article on The Uncanny Valley by Masahiro Mori (1970) Energy, 7(4), pp. 33-35 [Translated by Karl F. MacDorman and Takashi Minato]. Have you ever experienced the uncanny valley effect, for example, when watching a photoreaslistic computer generated animation? As gamemakers pursue photorealism, there is the danger that their game characters will put off potential players if they stray into the uncanny valley, as Clive Thompson warns in his 2005 Wired magazine commentary “Monsters of Photorealism”. When applied to special effects in movies, the implications of the uncanny valley are clear: if a filmmaker strives for a very high level of verisimilitude in computer-generated characters, they may risk taking the humanlike resemblance too far, causing viewers to notice every detail of the characters’ appearance or movement that doesn’t conform to the way real human beings actually look or move. Our emotional response to these “almost human” characters will therefore be unease and discomfort, not pleasure or empathy. If the filmmaker decides instead to render characters in a more stylized manner, clearly signaling that they are not supposed to appear “almost human,” we will notice, paradoxically enough, all the aspects of their appearance and behavior that resemble human beings, and we will be more likely to perceive these characters as more complex and more “human” characters than the characters that are designed to look nearly human. We can extend the concept even further to acknowledge that, when an animated object or a creature that is clearly not human is shown onscreen exhibiting certain human traits or emotions, we may actually feel more sympathetic to that creature than we do to overly detailed “human” animated characters. James Portnow takes a similar viewpoint with respect to games in this article: GAME DESIGN: The Uncanny Valley. 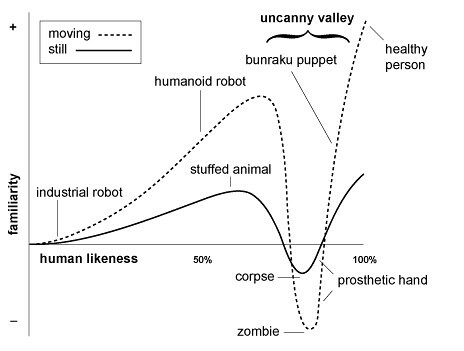 To what extent do you think that the uncanny valley is a plausible theory? In what ways do you think that computer games may be susceptible to the uncanny valley effect? If computer game characters can wander into the uncanny valley, so what? As well as providing environments within which games can be played, game worlds (and other virtual worlds) are increasingly offering the ability to record action from within a game. As the game worlds themselves support richer and richer interactions and behaviours, the game world becomes a virtual movie set that can be used for the production of game related “fan fiction”, as well as ‘standalone’ animated movies. Machinima is the name given to computer generated films that are rendered in real time using a game engine. That is, machinima represents a form of emergent gameplay in which the game characters are treated as “digital puppets” and used to act out a story that can be recorded using screen capture, or a screen recorder built in to the game to specifically encourage the recording of game demos, or more general machinima short films. Read the Futurelab article: Machinima and education (September, 2007). Bear in mind the following questions as you do so. What are the four (4) most common machinima production techniques identified in the article and what do they involve? Give two or three examples of how the genre of a game can influence the sort of machinima it can be best used to create. In what ways does machinima ‘democratise’ the film-making process (that is, how does it lower barriers to entry for people wiching to get started with film-making?)? If you are interested in the evolution of machinima, this article from the August 2007 issue of EDGE magazine (issue 178) is a good place to learn more: Screen Play: The Future of Machinima. The best produced machinima films are scripted in a similar way to any animated short film, and then acted out using game characters. As well as one off short films, machinima has spawned several of its own series, such as The Strangerhood, a sitcom(?!) created using The Sims, which even attracted a review from the BBC when it was launched several years ago: Review: The Strangerhood (via BBC News). See if you can find out what other ‘cult’ machinima series Rooster Teeth, the producers of “The Strangerhood”, created using the Halo game engine? The two videos recommended in the presentation can be found here: What is machinima? and Inside the Machinima (both on Youtube). One early use of machinima was as a production technique for creating cutscenes in one game, using the game engine of another. This approach has quite a long history, and is described in this Gamasutra article Machinima Cutscene Creation, Part One dating back to September, 2000, and followed up in Machinima Cutscene Creation, Part Two. If you are interested in creating short, cutscene films, read the above two articles. They provide a good introduction to the storytelling techniques that go towards making an effective cutscene. In more recent times, the growth of online multiplayer games has enabled full ‘cast and crew’ machinima productions, in which one character may take on the role of cameraman, filming the action as it is ‘played out’ by characters controlled by other game players. If you would like to view some more machinima, there is plenty on social video websites such as Youtube, as well as on dedicated machinima video sharing sites such as machinima.com. The GameSetWatch article World of Warcraft Exposed: A Moviemaking Culture describes the rise of machinima in the massively multiplayer online role playing game (MMORPG) World of Warcraft (WoW), and provides several links to directories of machinima created in that virtual world. Picking up on a post from earlier this week, (Breathing Life into Animated Objects), why not have a go at creating some simple animations of your own. Here’s a rather blurry tutorial of how to do a ‘traditional’ bouncing ball animation in pencil (the lines are faint at times – try watching the video in full screen view…): the bouncing ball tutorial (pencil). If you fancy something a little more, err, casual, then why not try the online AniBoom shapeshifter application (bouncing ball tutorial). If you’d rather just play a game, it being Friday and all, then why not try Grid16? There are no instructions given (apart from the hint that you need to use the arrow keys!). The game is made up from 16 minigames, each of which tests a particular style of game mechanic. See if you can work out what the aim of each minigame is, and then see if you can improve your score! In several of the most recent, previous posts, we’ve considered how stories can be plotted in a variety of ways around narrative events that take the characters in the story on an emotional journey (and hopefully take the audience with them on that emotional journey too!). So how can an animator create a character that the audience comes to identify with on a physical level, as communicated to the the audience through animation? So for example, if you were to search for “principles of animation”, you’re quite likely to come across references to “the 5 principles”, or “the 12 principles”, or even “the 28 principles”. Most commentators, however, would go with 12 – the twelve principles – as developed by a core team of animators from Disney Studios in the 1920s and 1930s. If you’d like to listen to a brief (15 minute) summary of what constitutes each of these principles, try this Introdution to Cartooning: Principles of Animation presentation. If you prefer the written word, I’ll be drawing on “Applying the 12 Principles to 3D Animation” by Tito A. Belgrave and “The 12 Principles of Animation (annotated for stopmotion by Mike Brent)” to try and characterise these principles. My summaries of the principles are very brief though, so if you would like to learn more, please see either (or both) of those references for more detail. Although the squash and stretch effect can be exaggerated, it is important that the “mass” of whatever is being transformed is preserved. For example, if you are animating a bouncing rubber ball using clay, you would not add or take away any of the clay as you record each frame. Before a character performs an action, it should physically “wind up” to perform that action. Anticipation draws the attention of the viewer, so that they focus on a particular area of the screen and prepare themselves for something to happen there. The classic example is of throwing a ball, in which the character draws their arm back in a possibly exaggerated way, before performing the action. Without anticipation, you have surprise – or maybe even an unnatural looking action. Suspense draws on a slightly different sense of anticipation, in which the viewer has an expectation that an action is will occur, but they are not sure where or when. Staging refers the set – or setting – of the scene, and the way in which it is portrayed. Staging is an important element of all the dramatic arts, from theatre, set design and stagecraft to film cinematography. In animation, staging a scene is likely to involve “set design”, “lighting” and choice of camera angle and other camera techniques (close-ups, slow-motion etc. ), as well as visual composition of the scene in much the same way that a photograph is composed. Straight-ahead action refers to a production technique, such as stop motion animation, in which a scene is captured in frame order – for example, using motion capture or a dynamic computer simulation. Pose to pose refers to the key frame technique of animation, in which certain key frames, or poses, are drawn first, and then in-between frames are added that “move” all the elements from one pose to the next. Follow through refers to the way a character behaves whilst completing an action, and can often be used to communicate a character’s feelings about that action or the likely consequences of it. In the case of throwing a ball, the action continues after releasing the ball, both in terms of how the character’s arm moves, but maybe also their facial expression as they realise how good their throw was. Overlapping action relates to the follow through behaviour of ‘secondary’ features, such as the motion of hair or clothing. The main focus is on the motion of the arm, but this must be dressed with overlapping action to make it look real. Most actions start slowly and end slowly. If you think of a car, it doesn’t go from 0 to 60 instantaneously, nor it is likely to stop immediately from traveling at any speed. Slow in and slow out models this acceleration and deceleration. Most things don’t move in straight lines. if you throw a ball, it doesn’t fly horizontally for a bit, then drop vertically down. Gravity acts on it all the time, pulling it in a downward arc. For body parts, if you swing your arm round, your hand doesn’t describe a square shape – it follows a circle, an arc, centred on your shoulder. Secondary actions are the incidental actions that make things look more realistic and may add to the anticipation of an action. For example, our ball thrower might be playing with the ball in their hands, or bouncing it from one hand to another, before actually performing the main throwing action. The movement of hair or clothing, or body twitches and facial gestures, are often likely to count as secondary action. Exaggeration can be used to focus attention, and stress a particular action. Exaggeration can also be used to develop character, as for example in the case of a caricature. Getting the drawing – or computer model – right. Whatever you’re animating should be a solid drawing, well crafted and executed and apparently capable of responding appropriately to the physics of the world it is performing in. The characters should appeal to the audience. They should be able to provoke an emotional response and also demonstrate their own “emotions” through their actions and gestures. Developing a little further the story of Making Pictures Move and the tale of convergence that is Bringing the Digital World Alive, we shall have a quick peek at what was going on in the middle of the 20th century. The development of electric ‘cathode ray displays’ – that is, CRT (Cathode RayTube) displays meant that it became possible to create electronic images on a small screen directly, rather than projecting light through a series of rapidly changing fixed film images on a movie reel. 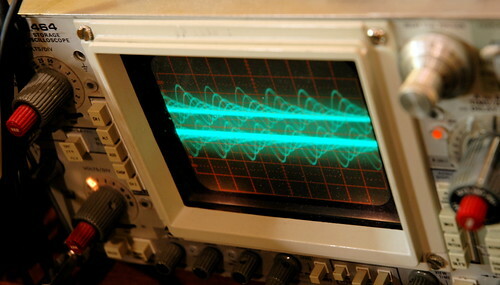 If you have ever seen a traditional oscilloscope, this a CRT in it’s ‘simplest’ guise. This new media was soon appropriated by experimental digital artists such as John Whitney. Here’s a video of his 1961 showreel: “Catalog”. Whitney pioneered techniques in the creation of both digital imagery and electronic music. If you search for “John Whitney” on Youtube you are sure to turn up several other examples of his work. We may assume that a time will come when that which I am about to describe will name itself—but for now: ‘Computational periodics’ is a propositional and tentative term which may help to designate a new unified field for a heterodimensional art; a field whose special dimension is time. An art which is temporal, as music itself; being, that is, spatio-temporal. An art whose time has come because of computer technology and an art which could not exist before the computer. As we shall see later, creating soundtracks for computer games has required innovations in the composition of repeating elements that may have to play for many minutes, even hours, and early scrolling background imagery also used to require repeating elements. I wonder too, whether ‘games’ like flow, which I introduced In the Beginning…, may be said to demonstrate some sort of “computational periodicity”? What was the aim of Space War? What might a design document for it look like? This review of the Space War ‘project’ has some interesting things to say about the design brief that informed the creation of the game: SpaceWar! – the First Computer Game.